According to a new report, beginning farmers are bearing the brunt of climate change and drought, but they might also hold the key to surviving it. Two years ago, in the middle of summer, the water was shut off on the 143-acre farm and ranch that Dustin Stein manages in Mancos, Colorado. As a farmer at the beginning of his career, Stein, who runs Stubborn Farm, was fortunate to share senior water rights with his landowner—a sought-after claim in this part of the country. This seniority meant he had access to a backup reservoir, but even that only gave him two more weeks worth of water and didn’t guarantee that the record-setting drought wouldn’t have a serious effect on his 75 head of cattle, row crops, pigs, and flock of hens. Stein survived by watering his perennial feed crops as little as possible and bringing in hay for the animals. Luckily by the next season there was more water. But if he’d had junior water rights, like most beginning farmers, his water would have been turned off earlier and he might have had to get a day job. “Being a younger producer just getting into it, it’s pretty scary to think that if I had to attribute one resource to my livelihood, it would be water,” says Stein. Stein is one of over 400 growers who participated in focus groups and a recent National Young Farmers Coalition (NYFC) survey to gather baseline information from young farmers and ranchers in the Western United States tackling increased water scarcity. The group published the results in a new report called Conservation Generation: How Young Farmers And Ranchers Are Essential to Tackling Water Scarcity in the Arid West. It found that factors like climate change and population growth have made water availability for agriculture a very real issue. In fact, for many young farmers, water is an even larger concern than access to land and capital. Water use and availability has a direct impact on the feasibility of farming in this arid part of the nation. And since farms in this area grow about 80 percent of the nation’s winter food supply, the survey’s results are relevant for the entire country. “Even if you’re reading this report in D.C. or Minnesota, this part of the country implicates all of those states,” says Kate Greenberg, study author and Western water coordinator for NYFC. Over 90 percent of the farmers in the survey said they were actively conserving water, but Greenberg stressed that their concern isn’t new—farmers have been implementing water conservation practices for generations. It is the context and the obstacles to success that have changed. “We’ve never had a population this size on the planet. And the extended drought and climate change, paired with unaffordable land … all make for significant barriers,” Greenberg adds. And those obstacles often keep farmers from adopting the types of conservation practices they might prefer to in an ideal world. The somewhat archaic method of water rights allocation used all over the West—known as the Doctrine of Prior Appropriation or “first in time, first in use”—takes some time to adjust to, says Mike Nolan, owner of Mountain Roots Produce. In a nutshell, each farm has a number and the lower his number, the more likely he is to get access to water. When it comes to allocating river runoff in his Colorado region, Nolan says, the number of farmers who get water on a given day is determined by the person running the damn, the demands on the river, the communication between ditch riders and ditch managers, and the water commissioner. Because the farms with “senior” water rights are generally established, it’s a process that can leave farmers with junior rights, literally, in the dust. “Some years we might be fine on water and other years we might have nothing—that’s kind of the norm,” said Nolan. Fortunately, in the region of Colorado where he’s farming, he also has access to a limited quantity of water from a nearby reservoir. Another relic of water law is the commonly held perception that farmers must “use it or lose it,” meaning if a farmer does not use all the water she is allocated, she’ll be forced to forfeit some portion of her rights. Greenberg explained the risk of actual forfeiture is very low (there is little enforcement of the principle), but these ancient rules cause confusion and, according to the NYFC survey, might prevent some farmers from seeing the benefit of water conservation. But the biggest challenges to widespread implementation of water conservation practices have more to do with new farmers “not seeing the forest for the trees,” says Nolan. As a 34-year-old who has farmed in Colorado for six years and owns 13 acres, Nolan says many new farmers are caught in a chicken-and-egg bind. They don’t treat water conservation as part of a longer-term strategy that will keep their businesses viable. On the other hand, they must have a viable business to be able to afford many irrigation improvements, he says. “It’s hard to talk to people about water conservation who have one acre in production with a walk-behind tiller and really tight margins,” Nolan explains. Not to mention the fact that many water-saving practices—like cover cropping—can take years before a farmer notices any changes. And while there are federal cost-share programs from entities like the U.S. Department of Agriculture’s National Resource Conservation Service (NRCS) that can shoulder the costs of some conservation practices, farmers and ranchers in the survey cited lack of access to these programs as another barrier. These programs are traditionally geared towards larger operations (over 100 acres) and the bureaucracy and wait times producers must endure before receiving funds can be prohibitive, especially to a beginning farmer low on capital. Out of the 379 survey respondents, only 38 percent own their land—and Hoyt and his fiance were in that group. They were able to find a 72-acre parcel with junior water rights for their diversified operation of market vegetables, laying hens, pigs, and dairy, but only because they had off-farm incomes and the property had been “destroyed” by the previous owner. Hoyt said the startup and water costs “scare the living daylights” out of many young people he knows who would like to start farming. How are young farmers in the West actually growing food with so little water? As with many challenges on a farm, the solution is independence and ingenuity. The NYFC survey found that building healthy soil is the most common water conservation strategy used by young farmers in the West. Through practices like cover cropping, mulching, and reducing tillage, these farmers can increase the water holding capacity of their soil, while improving biodiversity, and upping crop nutrients. Another tried and true approach is involvement in local communities, governments, and conservation boards. Nolan, Hoyt, and Stein are all members of the Southwest Colorado Farmer and Rancher Coalition. 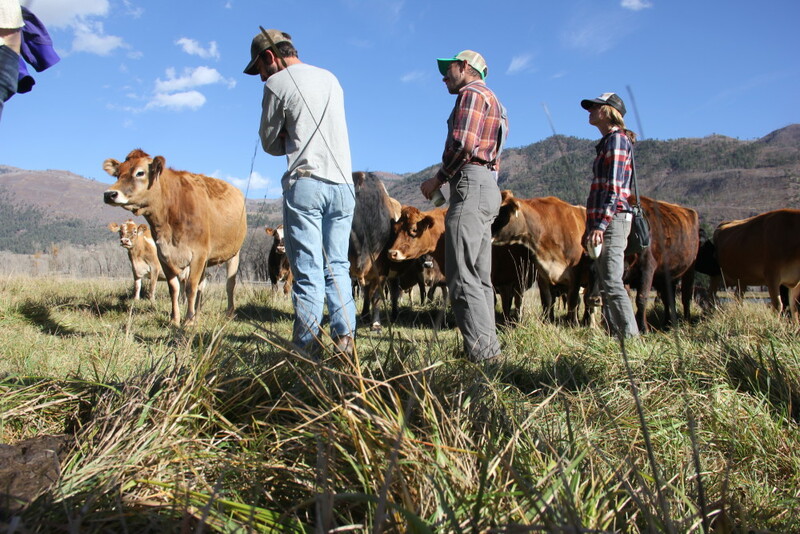 The group recently merged with the decades old Rocky Mountain Farmers Union—a marriage that has joined first and multi-generation farmers of varying ages. Greenberg says because policy drives the agricultural landscape in this country, it is essential that farmers “have a seat at the table” when and where local policy decisions are made. The report also put forth recommendations about what can be done next. The list includes protecting irrigated farmland (through efforts like conservation easements); strengthening incentives and education for saving water; and helping city-dwellers better understand the connection between the water they use and the food they eat.